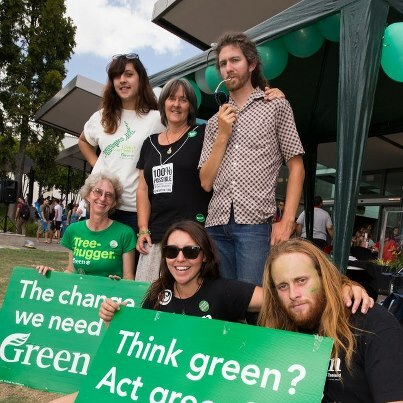 I’m acclimatising to a new city and a new campus, and thus, here is an O-week post about the Greens on Campus Waikato. We’ve already met for some KOA action (of which others have posted much more than I this summer, so I won’t go over it again) and we’re just starting on the new “I’m in for the future” campaign to run through 2013. They’re a keen bunch; Waikato holds the record for sustainability initiatives being put in place earlier than any other campus in Aotearoa/NZ, has some of the flashest recycling bins scattered around the campus I’ve seen anywhere, and environmental science/common sense is ingrained in the University administration. Looky here, a whole page about the environment on the academic website! So when campus Greens said they wanted to erect a geodesic dome, WSU said, “sure”. 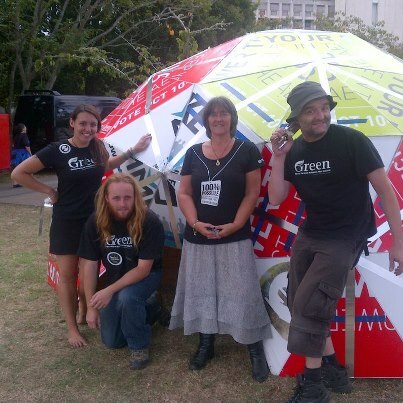 The stall was not adjacent to the dome, which is made of recycled coreflute billboards from the 2011 election campaign, so there was a bit of to-ing and fro-ing to keep checking on it and answering questions from bystanders. 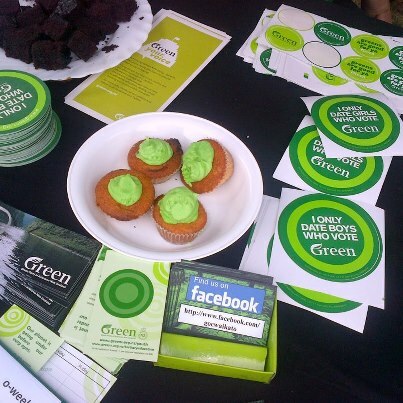 Greens on Campus co-convenors Theresa and Amy had organised a really good stall kit, and as we set up at 9am, it all went up very quickly. 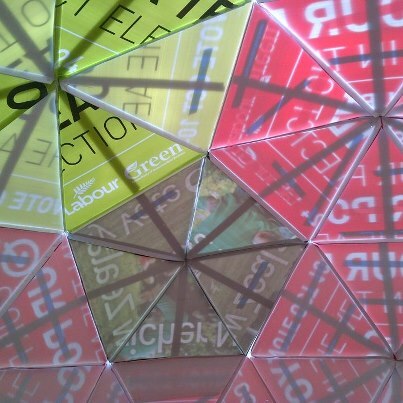 ‘Many hands make light work’ was truly the order of the day as first the stall, then the geodesic dome were set up. 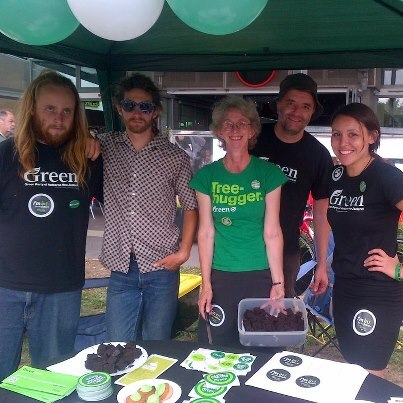 It was our privilege to have Green MP Cath Delahunty with us for the day, which flew by as we conversed with students, handed out stickers, leaflets and cake, and signed up new and old members to the club. We even got photographed by the Uni marketing photographer, and this pic went up on the University of Waikato FB page in the ORI 2013 album.